1. Apologies. These were received from: Committee Member Mrs S. Harrison; and also from Mr and Mrs D. Carnwath, Mrs. G. Kay, Ms E. Lloyd-Jones, Mrs. T. Gibson, Dr and Mrs A. Torrance, Mr and Mrs D. Pell and Mrs. Ann Wootten. 2. Minutes of 14th AGM. Held at Morston Village Hall on Saturday 25th June 2016 at 6.30 pm. Proposed as correct by Dr Tibbetts, seconded by Mr Metcalfe, they were unanimously approved and were signed by the Chairman as a True Record. 3. Matters Arising. The Chairman announced that the PCC had again proposed Mr Wingfield as their representative on the FMC Committee. Approved unanimously. 4. Annual Appointments/Reappointments. Mr Joc Wingfield proposed the re-election of Mr Rob Metcalfe to the Committee. This was seconded by Dr Peter Tibbetts. (Mrs Carole Bean, Dr Antonia Hardcastle, Mrs Susy Harrison and Dr Peter Tibbetts were re-elected in 2016). The appointment was approved unanimously. 5. Appointment of New Committee Member. Dr Peter Tibbetts proposed the appointment of Mrs Sandra Morris to the committee to replace Mrs Mally Bullard, who is standing down having served on the committee since the foundation of the ‘Friends’ in 2003. This was seconded by Mr Rob Metcalfe and approved unanimously by the committee. A vote of thanks for Mrs Mally Bullard was proposed by Mr Joc Wingfield and unanimously supported by the committee. 6. Committee vote for Chairman and Secretary. Dr Tibbetts was nominated for the combined position of Chairman and Secretary. This was proposed by Mr Rob Metcalfe and seconded by Dr Antonia Hardcastle. The appointment was approved unanimously. 7. Committee vote for Deputy-Chairman and Treasurer. The Chairman proposed Mrs Carole Bean to be re-elected as Deputy-Chairman (seconded by Mr Joc Wingfield) and Mr Rob Metcalfe to be re-elected as Treasurer (seconded by Mrs Carole Bean). The appointments were approved unanimously. 8. Treasurer’s Report. (FY 2016-2017). Mr Metcalfe presented the accounts and stated that the FMC’s income was up more than £5500 on last year. This was due largely to the increased takings at the 2016 Book Sale. The usual expenditure was similar to last year, but with a slight increase in the Book Sale costs due to advertising and new bannering. The balance of income over expenditure was therefore up by £5,000 at just over £17,600. The balance in the Current Account is, consequently, up to just under £79,000. Mr Metcalfe also pointed out that the income from ‘Friends’ subscriptions has been static for several years now and suggested that we have a promotional drive to recruit new members. 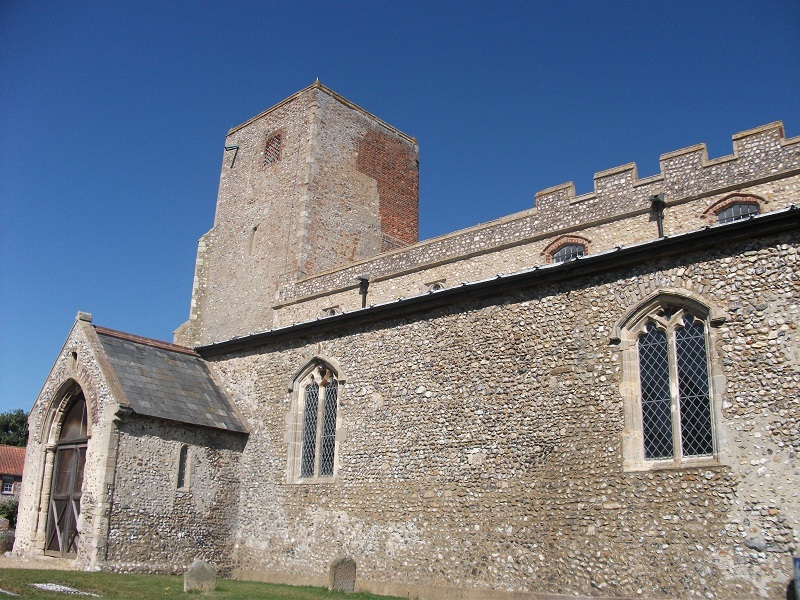 It was suggested that we promote the ‘Friends of Morston Church’ more at our events and have a more prominent presence in the Church, particularly at the Christmas carol service. We should approach those who have had Christenings and weddings at the church and also the next generation of the families of those on the Memorial Board. It was also suggested that perhaps life members (£100) might be willing to reaffirm their membership by making a further contribution. A faculty is being applied for from the Church of England and the Bat Conservation Trusthas been contacted. Work is expected to commence late summer/ autumn. The Chairman thanked Mr David Carnwath for his informative report. The Chairman also thanked all of the committee for their hard work over the year in helping to set-up and organise the quiz, the book sale and the Shovell dinner. He particularly thanked Mrs Mally Bullard, who has served on the ‘Friends’ committee since its inception. She has never taken the limelight, but has attended every event that she has been able to, providing encouragement and help whether it be providing raffle prizes, cooking food for the Quiz, helping with plants at the plant sale and beavering away behind the scenes with endless washing up at the Quiz night. Mally will be greatly missed on the committee, but we look forward to seeing her at our events. He, once again, sent a special “Thank you” to the many helpers at the Book Sale and particularly to Lady Jane Barson, who was invited as a guest for the weekend and ended up being the mainstay of the catering department! The food and drink along with the plants added about £2,000 to the sale of books. Once again we were spoilt by the ability to use Morston Barn, which provides such a beautiful setting as well as making the transport of books slightly less arduous, so many thanks to Rob and Sally Metcalfe. The Chairman also noted that no new ‘Friends’ had been recruited in the past year. 10. 2017-2018 Special Events. Mr Wingfield has organised the 2017 Shovell Dinner for Sat 14th October (Mr Jim Crossley on “Jutland: Who Won the Battle?”). The 2018 Quiz was agreed to be on Sat 3rd Feb. The Shovell Dinner will be on Sat. 13th October 2018. Mr Metcalfe announced that the Book Sale would be on 5th – 7th May 2018. The 2018 AGM will be on Saturday 16th June. The Chairman presented a proposal for a possible trip to the Godolphin Dalham Hall Stud in Newmarket. Sam Bullard, who is the Director of Darley Stallions at the Stud has kindely offered us a tour, which we could combine with a lunch in Newmarket. A rough date of June 2018 was agreed. Mrs Sandra Morris presented the possibility of an ‘Impromptu Skakespeare’ event at her house in Morston with the Morston village hall marquee in the garden for the audience. Dinner would be included. Mrs Morris will contact the players to find out when they would be available. It was agreed that a summer date with no evening high tide would be best. 11. AOB. The Chairman summarised some issues that we have had with our bank (TSB), who state that our account is not protected by the Financial Services Compensation Scheme (FSCS). However, having written to the FSCS, they have assured us that our account would be covered up to £85,000.